John Hughes was busy during the mid 1980’s. Starting with Sixteen Candles in 1984, he made a movie a year until 1989’s Uncle Buck. He is best known for creating classic teen movies, dealing with themes involving teen angst. 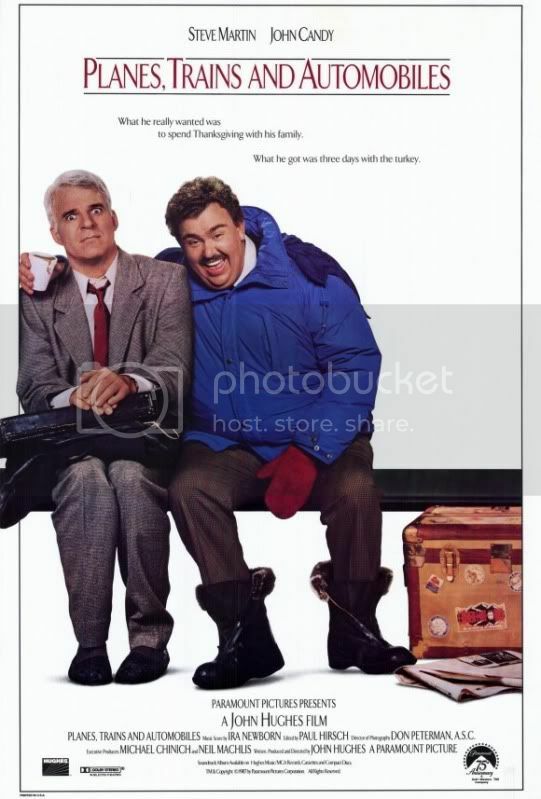 It is interesting, then, that he made Planes, Trains & Automobiles in the middle of this streak of films. 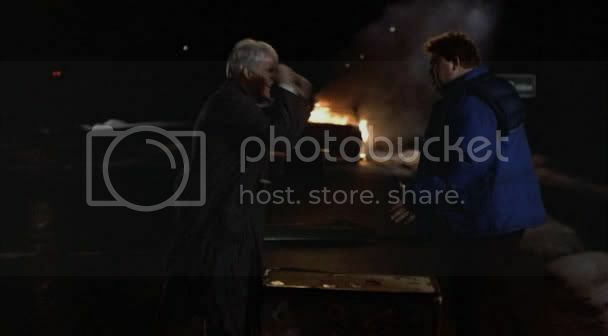 Planes, Trains & Automobiles is a buddy comedy starring two middle aged men. This is not a terribly common formula in Hollywood, unless they are both cops. Here, however, we have Steve Martin, playing a marketing executive, and John Candy as a shower ring salesman. Neal Page (Martin) is running late from a marketing meeting in New York, eager to reach his wife and kids back in Chicago before Thanksgiving. Seeing as he’s played by Steve Martin, everything about the trip will go wrong. The journey to the airport is a fiasco, as his cab is stolen by another patron and he fears he will miss his plane. 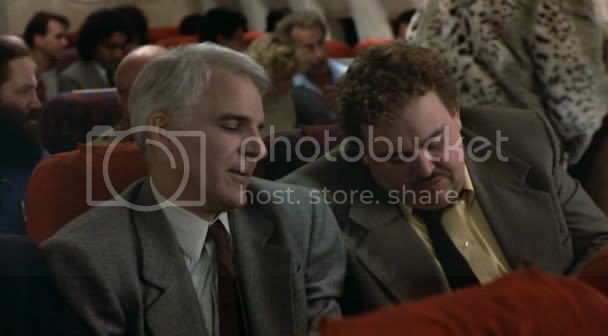 This is just the start, however, as on the plane he finds himself sitting next to Del Griffith (Candy), the same man who stole his cab in New York. Del is a sincere fellow, though he talks constantly and shares pointless anecdotes with anyone willing to listen. Neal is quite annoyed, but this, too, is just the start. Poor weather in Chicago prevents them from landing and they are routed to Wichita. Circumstances in Wichita ensure that the two of them are forced to share the last hotel room in the city. After an eventful night together they continue their journey to Chicago together, out of necessity. Their relationship is constantly strained as they travel by train and automobile in an attempt to be home for the holiday. The movie is simple, built solely on the love/hate buddy dynamic of the two leads. All of the misfortunes that befall the pair are in service to this relationship, providing moments of contemplation alongside the comedy. The movie is rather funny, with both established actors being allowed to play to their strengths. Hughes shows a knack for employing profanity to great effect. Instead of bombarding the audience with constant language, the majority of the film stays strongly in the PG or PG-13 categories. One scene, however, has Steve Martin finally snap under the constant pressure, and the sudden onslaught of strong language is both justified and hilarious because of its lack of precedent. Planes, Trains & Automobiles doesn’t try anything outrageous, shocking, or unconventional. It is well-made, with fine performances from the only people who matter. The ending might be a bit too saccharine for some, but I thought it fit fine for a comedy like this. It isn’t Airplane!, remember. I laughed a fair amount during the film, and found myself enjoying the performances, even though I’ve never really been a fan of either Candy or Martin. 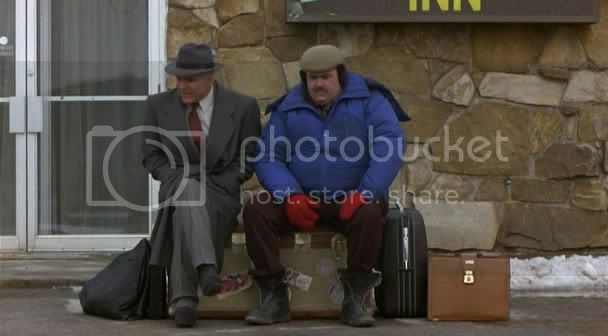 For fans of simple, pleasant comedies, you can’t go wrong with Planes, Trains & Automobiles. This entry was posted in 3 pirate flags, 3 stars, Movie Reviews, P on January 4, 2010 by Tim Irwin.